This plate, which shows the region in the lunar highlands around Scheiner and Longomontanus, is remarkable for two reasons. 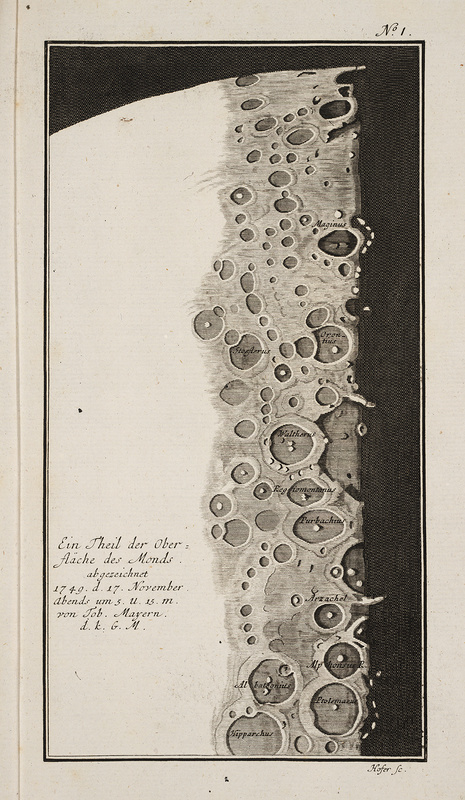 First, it is a mezzotint, the first time this technique was used for a lunar map (if we except a tiny text engraving of the crater Plato by Bianchini, not shown, but in item 11). Second, the engraver failed to reverse the drawing, and so the craters which appear here on the left of the terminator should actually lie on the right. As the caption belatedly explains: "If you want to view the print correctly, you must hold it up to a mirror."